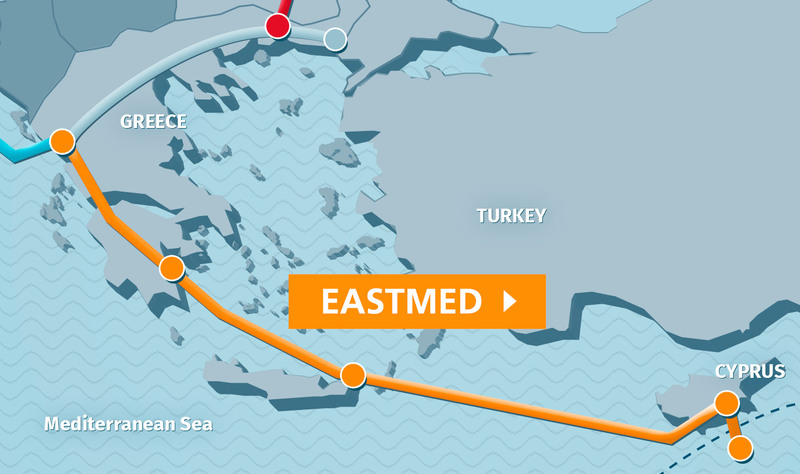 Within the next 12 months, the construction of the East Med pipeline is set to begin. According to plans, it will be used to transfer gas from the Eastern Mediterranean to Europe. According to Israeli Energy Minister Yuval Steinitz, it is the “longest and deepest gas pipeline in the world” and it will take five or six years to complete its construction. The European Union estimates initial construction cost to be 7 billion euros, while the project, according to the minister, will be funded by private companies and institutional lenders. In an interview with Bloomberg, the Israeli official revealed that talks are underway on the construction of a new submarine gas pipeline between Israel and Egypt as part of efforts to transform the Eastern Mediterranean into an energy hub for exports to Europe. As Israel’s natural gas reserves increase, construction of this pipeline could also begin next year by linking Leviathan and Tamar, within the Israeli Exclusive Economic Zone, to existing LNG facilities in Egypt. This new pipeline will allow Israel to export additional gas to Egypt from the maximum quantity of 7 billion cubic meters a year that is currently being exported through the EMG pipeline connecting Israel to the Sinai Peninsula. “There is no final decision yet, but there are talks,” said Yuval Steinitz, ahead of April’s second Eastern Mediterranean Natural Gas Forum. The first meeting with the participation of delegations from Egypt, Israel, Greece, Cyprus, Jordan, Italy and the Palestinian Authority resulted in all parties involved agreeing to generate revenue from gas reserves in the Eastern Mediterranean, using existing infrastructure and adding more quantities.